Radar image for Williamtown at 3:20pm. Gustnadoes are classified as tornadoes as they are a rotating column of air, but technically are not tornadoes. 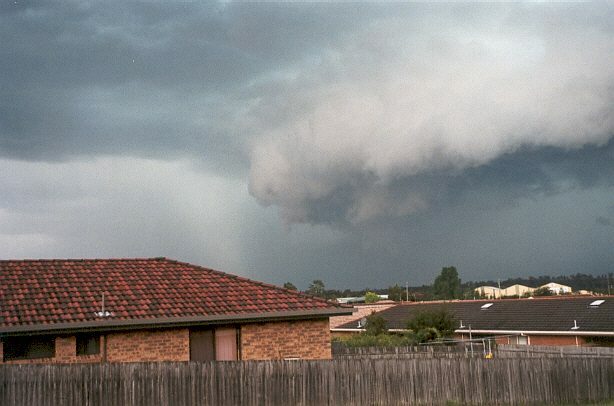 Not like tornadoes, which often form at the back end of a thunderstorm, gustnadoes occur at the front end and are often associated with downbursts. There have been reports of sighted tornados when the storm hit around Nelson Bay and Corlette. This evidence is backed up by the irregular direction in which the trees have fallen from one area to another and the locality of the damages. Also, a track of damage was left in Corlette. All of this suggests the possibility of some sort of vortex movement associated with a tornado or a gustnado. Most of the damage that occurred were typical for wind strengths between 65-100kts (120-180 km/h), however, the winds may have been slightly higher then this in some places. Some of the other significant thunderstorms occurred near Cessnock, Barrington Tops, Denman area and western parts of Lake Macquarie. Isolated supercell storms were observed around the Barrington Tops and the western parts of Lake Macquarie. For those who are more technically minded, the Williamtown sounding for 0000z showed that the surface lifted index (Li's) was -0.3, 500hpa winds were blowing from 300° at 55kts while the overall Convective Available Potential Energy was 112.